of a family of five. an idea picked up from pinterest. Here you can see my lighter version of it, it is more like a “family tree”, with five leaves showing on first sight. that there is something going on, she is represented with an imprint of a real leaf on the right. Dad and the three daughters are there with their finger prints in leaf shape. For mum to see whose fingerprint is which, the day of their wedding is engraved on the back of Dad’s “leaf” on her left, the birthdays of the daughters on their respective leaves. 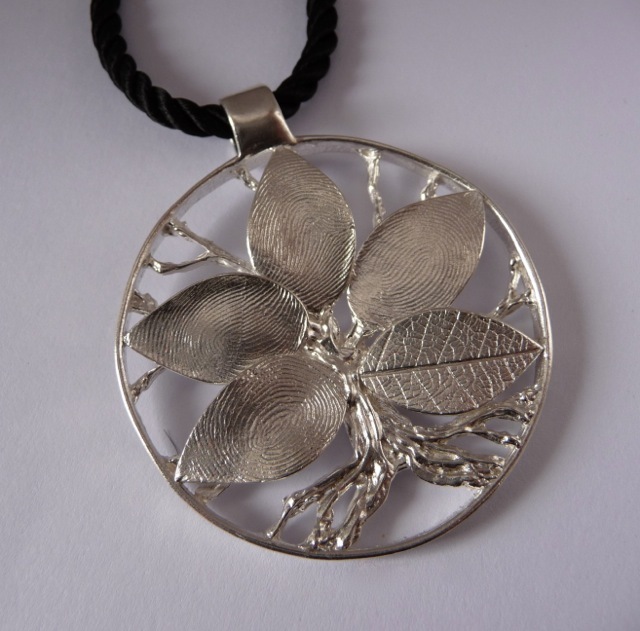 Surrounded by a free-shape frame and supported by branches, this pure silver pendant was certainly a very special commission work for me to make from my favourite medium, precious metal clay in silver. What a beautiful idea, and so beautifully done. Thank you for your comments! I really enjoyed making the pendant with the challenge that it had to be kept secret and that the fingerprints had to be taken and sent to me since not all family members live close. Pity that commissions like this one don't come often!